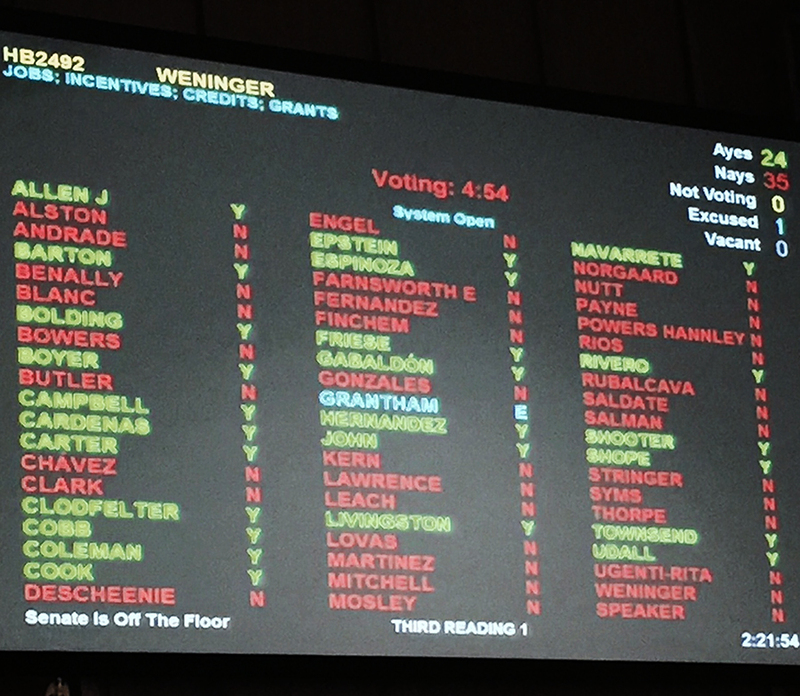 A bipartisan vote stopped HB2492, a corporate welfare bill for Arizona's largest, most successful employers. 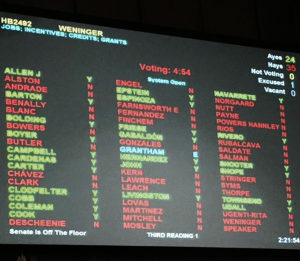 A bipartisan vote stopped HB2492, a corporate welfare bill for Arizona’s largest, most successful employers. This is an open-ended tax giveaway deal. If we allow the universities to get back the taxes they paid, that ~$30 million dollar hit to the general fund will be felt somewhere else in the budget. Who will lose? Also, there is no end date on this deal and no sunset review. These funds will be used to take on more debt. Why give back taxes and go into debt, when we could just fund the universities adequately? We could appropriate the funds to the universities to pay for at least the building repairs and perhaps a percentage of a designated number of research facilities. What is the impact on tuition in the future? I don’t want to do anything that could raise university tuition in the future. I see giving away tax money (with no fiscal cap or future end point) and taking on more debt as risky. What is the impact on neighborhoods? University of Arizona building projects are a HOT topic these days in Tucson. The proposed six-story, 1000-bed Honors College complex will occupy an entire city block north of Speedway, and neighbors are not happy. Tucsonans, who value historic architecture, are fighting to protect downtown neighborhoods. When I read the Capitol Times article referenced, I realized that there are many Republicans who share at least some of my views on bonding, debt, and appropriations. “I applaud the idea of getting resources to the universities. I do think there’s strong support for that. And I appreciate outside-the-box thinking as a general rule. However, at this point, this proposal is a real challenge,” Mesnard said. Yarbrough said the concerns of lawmakers are two-fold. First, the idea that one special interest — in this case, state universities — would get to keep the sales taxes they would otherwise pay the state, cities and towns would open the door for a “multiplicity of other interests that would like special treatment,” Yarbrough said. Second, lawmakers are wary about putting a major expenditure on auto pilot. This convergence of fiscal opinion — even at a basic level — is great news in my opinion. Keeping my fingers crossed for potential increased university funding through appropriation and not increased debt. I found your statement that there are only “several” progressives in the Democrat caucus to be surprising. How do you define progressive and what are the other 9 or 10 Dems? when are you term limits are up? and democrats say they oppose term limits you avenaugh in there for ever? I plan to stay until 60,000 voters vote me out or 6 people carry me out. Same big issue we have with TEP and APS gold-plating and overinvesting in capital to boost their profits. It’s formally called the Averch-Johnson Effect, and is a distortion (read: inefficiency) with regard to how these entities are funded and where their incentives lie. Your intuition is exactly correct; Universities will build nice labs and fancy buildings to get their rebates, but skimp on salaries and other critical components of research & teaching. I’m glad to see that progressives and conservatives can find common ground, if for different reasons, on curtailing the power of the corporate state. In fact, I plan to go down to County Administration tomorrow to rail about wasteful corporate giveaways that Pima County keeps giving to Raytheon, Worldview, and other companies, while not getting good returns on our (as in we the taxpayers) money. I can think of a lot of people who need $50,000,000 more than Raytheon’s shareholders. Like our teachers. And single parents working three jobs to make ends meet because there’s no other way to pay for childcare, healthcare, and put food on the table. arpaio and purcell were voted out. changing demographics has something to do with it. that more then half of house democrats are latino. who does that scare more republicans or rich old white democrats who want to run for state wide off for their ego trips?